Our featured products this month are the Lilikoi Mineral Defense Moisturizer with SPF and the Lilikoi Light Defense Face Primer with SPF. Lilikoi also known as Passion Fruit contains Vitamin C and antioxidants which help with the visible signs of aging. 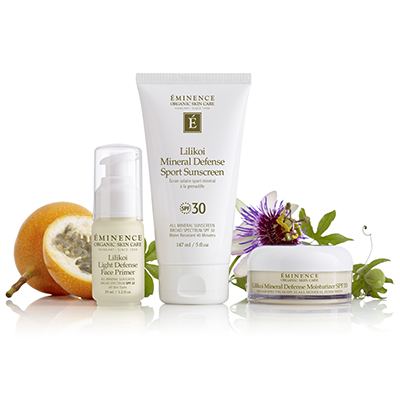 The Lilikoi Mineral Defense Moisturizer SPF 33 protects your skin for the sun and drying environmental stressors. It is suitable for all skin types and finishes without leaving a white cast. Your skin will be left lightly hydrated and protected from sun damage. The Lilikoi Light Defense Face Primer with SPF visibly improves the appearance of skin exposed to blue stress and helps to prevent sunburn. This is something that will be needed to get you through the upcoming Arizona summer! Just layer the primer on after your moisturizer or use it as a protective base before you apply foundation. It will give you that “lit from within” effect. Both of these products are available for purchase at all of our locations and can be used by your Esthetician during a facial.